This tutorial demonstrates how two Ribboxes attached to two shading groups can be used to create an effect that might be difficult or impossible to achieve using Maya's standard tools. 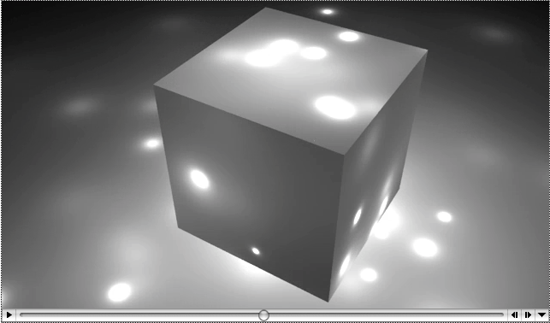 The workflow outlined in this tutorial produced an animation of nearly 400 point lights "parented" to a particle system - figure 1. Consequently, in order for surfaces to be effected by the "particle lights" they must have a Ribbox assigned to their shading group or groups. The role of the additional Ribbox is to inject into the rib stream a sequence of Illuminate statements that, in effect, re-activate the lights parented to the particle system. The following LoadExtension line should be added to the users custom RfM.ini file. append out "    Translate $x $y $z\n"
append out "    LightSource \"pointlight\" $n \"intensity\" $intensity \"from\" \[0 0 0\]\n"
append out "    Illuminate $n 0\n"
append out "Attribute \"visibility\" \"int camera\" 0\n"
# by the particle lights should have the following command in its ribbox. append out "Illuminate $a 1\n"
::RMS::LogMsg INFO "Custom TCL procs in ParticleUtils.tcl loaded"
Create an emitter. Provide the particles with a limited lifetime. Move the timeline and generate a few particles. Select the particles, then choose the transform tab in the Attribute editor. The default initialShadingGroup will be automatically assigned. The pre-defined variable OBJNAME will be automatically substituted by the name of the particle system. The parameter (0.005) will set the intensity of each light that the proc addLight instances for each particle. Some experimentation will be required before an appropriate value is chosen. to the project directory that Maya is currently referencing. Open the Outliner and make sure the particle and the emitter appears before the geometry that will be illuminated by the lights created by the particles. One way to fix such a problem is to edit the path to the shader in the attribute editor. For example, change $STAGE to the explicit name of the scene.